WITH GIVI YOUR SMARTPHONE IS ALWAYS WITHIN REACH! With the new GIVI Universal Pliers, a smartphone is attached to a motorcycle with total safety and convenience. 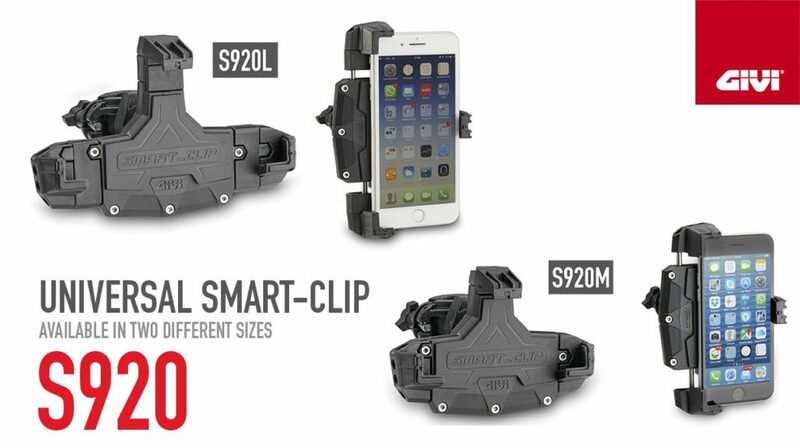 The S920L Smart Clip is the new universal smartphone holder pliers supplied complete with mountings, suitable for use on motorcycles, scooters, bicycles and quads. An accessory that not only provides comfort, but is also vital for safety! Today, travelling by motorcycle has all the advantages of modern technology. Riders can be protected by technologically advanced helmets that have great design and they can also safely carry luggage under the most extreme conditions, but one thing that is still missing is the ability to have devices at a rider’s fingertips.The process of pulling a smartphone out of a pocket whilst riding is not only uncomfortable, inconvenient and complex, it is also extremely dangerous. So GIVI developed the S920L Smart Clip which provides access to a smartphone in complete safety and comfort. Smart Clip is made of rubber-coated polymer technology which provides maximum grip in the areas where the smartphone is supported. It is compatible with tubular diameters of between 8mm and 35mm which means it can be mounted to areas of a two-wheel machine that are not perfectly round. It has been created to have a wide adjustment range to fit a variety of different smartphone / device models. The GIVI R&D Department has also worked on details that are extremely important but are often neglected: the Smart Clip is designed not to obscure the camera lens on most smartphone models, enabling filming from both front and side angles whilst on the move. Adjusting the orientation of the smartphone can be customized on many levels and the insertion and removal of the phone is facilitated by a special lock / release process. Finally, Smart Clip does not even fear the roughest of roads or terrain, thanks to an additional elastic strap which has been added to provide additional security by holding a smartphone in place, even when riding off-road!